« When we encounter very poetic poetry, do we view it as it was read when it was written? Not just in terms of its era, and not just in terms of its original language (if it’s translated), but in this sense: do we read it through the lens of knowing it isn’t from now? « Even the most beautiful work can seem of the past, of a very specific moment, and it’s very rare indeed that the opposite is true. We encounter classical poems through a lens so thick, it frankly stops many people at the door of poetry. So we might approach this massive, ambitious and admirable volume of Pierre Voélin’s life’s work, translated vividly by John Taylor, with a great appreciation that is perhaps qualified with a temporal footnote. This is often graceful, deeply felt poetry but it seems from a different time. This is a compliment in many ways: people like to read of the past more than they like to read about it. It is axiomatic, of course, that the work comes from another time, but I mean this modally, stylistically, too. Voélin’s work and its like will never be able to be written again. This powerful wadge of poems from a lifetime writing, is maybe the last of its kind. The great twentieth-century poet and his remarkably consistent aesthetic is here in these pages. That is powerful, but the work is also littered with phraseology, vocabulary and gestures that feel perhaps a touch too rich. That said, post-war central European poetics, especially Francophone works, is a battleground on which lyric sensibility and language itself can be reclaimed. 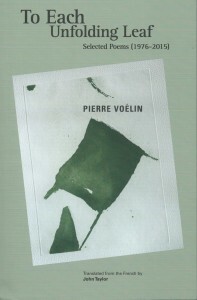 « There is perhaps nowhere that this tension is better exemplified than in the work of Pierre Voélin. Maybe it’s because Voélin hasn’t the harshness of some of his more noted contemporaries, or the vivid idiosyncrasy. He is instead controlled, elegant, insightful, cautious, concentrated. This extensive collection of his work in English is therefore, and without doubt, a considerable addition to the English reader’s awareness of a poet who represents more than the aesthetic of the French-language Swiss poetic canon. He is a poet of elliptical gesture, of imagery and patience, and as such his body of work is decisively poetic, in no way formal but also quite consistently pleasing and melancholy. Voélin seems in conversation with poets such as Yves Bonnefoy, André Frénaud, Philippe Jaccottet, Gérard Macé (all French-language poets, all men) but perhaps without the bite or linguistic play that marks the work of Char, Celan or Michaux. Voélin’s work is perhaps subtler, more involved with an active absence, maybe even, in stereotypical fashion, leaning towards Paul Claudel. « Perhaps this is his greatest achievement – to be clearly a poet who can be understood on two levels: one at the very surface, which will please many readers and become something of an inspiration. The other, those patient beyond my own reading, who will be rewarded with a depth that seems to be gestured towards throughout. « Inevitably the works, drawn from eleven collections published between 1976 and 2015, contain within them great multiplicities in terms of the content, Voélin’s concerns evolving as he ages. And yet the book feels uniform. Stylistically, Voélin remains the same. Simple, clear, gestural, empathetic, compassionate, curiously personal, homely even. This, I hope, guarantees the book a readership, as it deserves one.